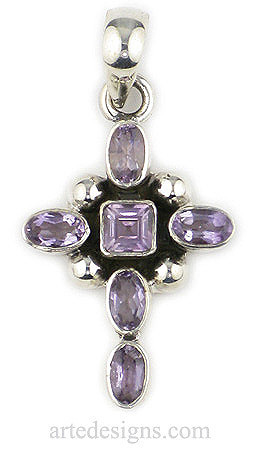 Gorgeous purple amethyst gemstones align nicely to form this classic cross pendant. Amethyst is said to bring serenity and peace of mind. It also helps prevent homesickness. It is the symbol of security. Approximately 1.25 inches high. Sterling silver setting.